I know I’m a bit late to the party, but I treated myself to one of those permanent gelatine plates at Christmas. I have done gelatine plate printing before, but my sessions were few and far between because of the need to plan it carefully: to buy the gelatine, wait for it to set and then make sure I did lots of printing before it went mouldy. Now I have finally bought one, I love it! I have it out all the time so I can take a few prints whenever I feel the need to get messy, make backgrounds on the train tickets etc and I love the fact that there are so many tutorials and blog posts about it online. You’ve probably seen evidence of its use cropping up on various photos of train ticket art, but here are a few of the prints I’ve made from it. They’re not very polished yet but I’m still playing! 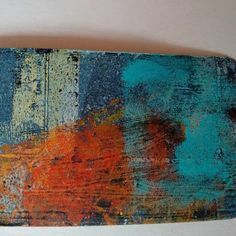 Since buying the plate, it has been interesting to see how it has affected my work and especially the train ticket art because I have been making that regularly. I have noticed that I am most inspired by light and shade and the results of light such as reflections and shadows. Also that most of my best art is almost accidental: I make the background on the plate and then observe what emerges once the print has dried and draw it out by highlighting it or adding outlines or details. Monoprinting, especially printing small things as part of a larger print surface is quite unpredictable and this lends itself well to this style. I pick a colour scheme or colours which I feel most drawn to at the time I’m playing with it (it feels like playing when I don’t plan anything!) and then just go with the flow. And using acrylics means that I have to work quickly, there’s no time to stop and ponder or the paint is dry before I know it! It’s unpredictability that excites me about art, the excitement of not knowing what will emerge or what that paper will look like when I peel it off the plate. 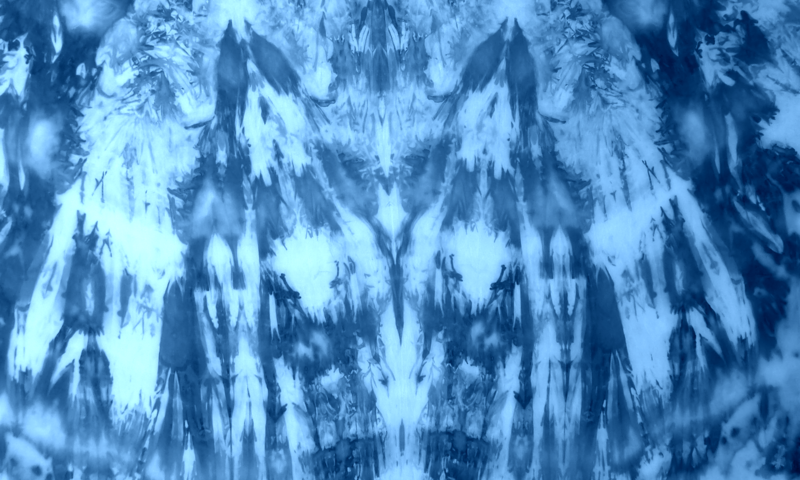 I scanned this into Photoshop and changed the colour (quite drastically!) and uploaded the design to my Redbubble shop – you can see on products here. Can’t remember exactly what I did for this orange one! The yellow and red print above came about in an unusual way. I hit on the idea of rolling gesso on to the plate and then printing it on to the train tickets instead of painting it on. It works well, allows more of the original ticket to show through and is a lot quicker. But what I also discovered is that some of the words printed on the ticket were being transferred to the plate – this print is actually on paper and it has picked up the shape of the train tickets and some of what is printed on them! I think it makes a very interesting print. 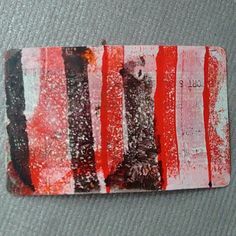 One of the train tickets which have been gesso printed – the red is acrylic paint and the black is Indian ink. Another train ticket – I do like this colour combination! Since the beginning of the year, I’ve been joining in an art making challenge called the Make Art That Sells: Assignment Bootcamp 2015. It is run by Lilla Rogers, a prominent art licensing agent in the US, in conjunction with the various courses she runs. I took it to help me get used to making art on different themes aimed at particular product markets, and I’ve been enjoying it tremendously, even though it is pushing me out of my comfort zone. The way it works is that Lilla gives participants a mini task on the first Monday of the month, which usually involves sketching or painting on a particular subject. Then the second Monday of the month we are given an assignment, with 2 weeks to complete it, based on the mini but for a specific market or product. If you would like to see some of the artwork which has been produced so far – here is a page with a link to the galleries. In January the theme was Edwardian brooches, and the final assignment was to design a journal cover with that theme. I started playing with handmade stamps first because I like the rough, abstract feel. I used some of these in the background or for texture (and they also found their way into my train ticket art!). Then I started sketching and eventually I scanned in the sketches, vectorized them, printed them out and painted them in different colour schemes. Here are the two designs I came up with in the end, mocked up as journals. I call this my frog journal though it has a lot more than frogs on it! This is the one I eventually uploaded, I quite like the ‘scary creatures’ sort of take on it though maybe a darker background would suit them better! I like the delicate lace designs on this one but I think the colours pop more in the first. For February the mini task was to paint or draw scenes inspired by imagery seen on vintage plates. This is one of mine – as you can see I’m not very good at painting people! The following week the assignment was to paint these scenes on circular pieces of wood! I discovered that wood slices (with bark still attached) seem to be fashionable at the moment for wedding table settings so I bought a pack of 20 and have been busy painting scenes and pictures on them! We only have to do one so it means I have plenty to spoil along the way! Here they all are, painted with black, white and some clear gesso all ready for decorating! I prepared the surface and then got going! Here are a few of them in progress – I eventually uploaded the two boat scenes to the gallery. I really enjoyed February’s challenge – I liked the broad nature of the theme and, as you will see if you look at the gallery, people interpreted it in very different ways and styles. It reminds me a bit of the sort of designs I used to make in fabric with my Rainy Streets series of postcards and my print gocco notebooks. If you follow me on Instagram you might have seen me posting slightly curious photos of what I was doing last week. A few years ago, I started collecting train tickets rather than throwing them away after journeys, because it occurred to me that they were the perfect size for little pieces of art or personalized labels/tags or business cards. In the UK they are just a bit smaller than ATCs (Artists’ Trading Cards), and have nicely rounded edges. Also, whenever you go on one train journey you seem to acquire about 8 of these, particularly as it often works out cheaper to split the journey into two rather than buying one for the whole way (even if you stay on the same train for the whole journey) – daft, I know! I’ve been randomly experimenting with them over the years, painting over some of them with black or white gesso to cover them, but last week I realised that I have several hundred of them now so decided to do it systematically. It was also fun to look back over where I had been and recall nice memories of days out. I laid down some textured wallpaper (which has now been randomly decorated in a pastel coloured rectangular grid!) and here is the first lot of tickets. This is a mixture of white gesso and opaque white screenprinting ink which was getting a bit thick and needed to be used up. I painted the first side and left it to dry. I got bored with white after a while and mixed some Dr PH Martin inks into it to have a bit of variety. So…. I’m going to set myself an Art Challenge: to paint or draw on one each day … at least until Christmas. I’m not going to labour over them or take a great deal of time, just have fun and splash paint or mess around with a pen and a doodle, and I’ll post them on Instagram using the hashtag #trainticketart . If you would like to join me, I’d love the company! Let’s see how much #trainticketart we can produce! Just leave a comment here, post pics on Instagram or Twitter or on your blog and if it takes off I’ll start a shared Pinterest board to pin them all. Let’s see if we can create a buzz!! Hope to see you on the journey! !